Gaff, gunter, lug, sprit, and sprit-boomed sails can have their draft changed by controlling the tension on edges, and particularly, the amount of “peak”, via peak halyard (gaff and gunter), luff downhaul (lugs'ls), and snotter (sprit tension). Sails won't look good or perform well unless these adjustments are correct for wind strength and point of sail. The luff and head are roped or taped a little “short.” Tension must be applied with outhaul, halyard, or downhaul to take all the wrinkles out of that edge of the sail, and then some. More tension in stronger winds. Halyards, particularly those in dumb sheaves (bee holes), may not exert enough tension to control luffs properly, so a tack downhaul in the form of a two- or three-part tackle may be in order. The peak halyard for gaffs and gunter yards, the tack downhaul of the lugs’l, and the fall of the sprit’s snotter should be attended to whenever wind strength or point of sailing change. Too little “peak” will result in wrinkles from throat to clew; too much, in wrinkles from head to tack. Edges of sails attached to spars with lacing, robands, hoops, etc., should be perfectly straight, with the bolt rope and corner rings spaced off the spar the same everywhere. If not, the shape of the sail will not be what the sailmaker intended. Lacing line should be low-stretch, light, supple stuff -- polyester braid or three strand. 1/8" or 5/32" diameter is a good size for sails up to 100 sq ft.
Too little outhaul on the yard, gaff, or boom will result in crowsfeet showing at each lacing grommet. Too much outhaul will result in a bag of loose cloth along the spar. 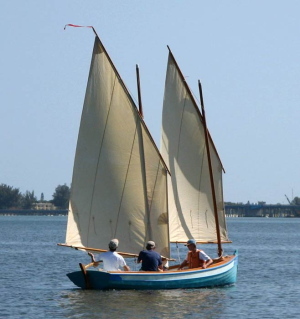 Outhaul tension on gaffs and yards should be carefully adjusted to suit expected conditions (wind, point of sail, sea state) BEFORE raising sail. Watch out for too much outhaul on boomed loose-footed sails. If horizontal folds or wrinkles appear above the roached (curved) edge of the foot, it’s over stretched. It’s very easy to use too much outhaul when trying to sail close to the wind. Remember that the clew of boomed loose-footed sails should be held close to the boom with a lashing or roband -- to maintain the correct sheeting angle and keep the boom from drooping when the outhaul is slacked. A special requirement for properly deploying lugs’ls with reefs is that the yard must be prevented from drifting away from the mast when the reef is tied in -- with a parrel line or similar restraint.